Garen Garibian came to the United States from Armenia about 20 years ago. Since then he has given up his career as a surgeon and discovered his passion for making jewelry. If you look at his winning piece, “Mata Hari,” it is easy to see that his skills as a surgeon have not been forgotten. This piece is professionally created and crafted with great precision and with an eye for detail and beauty, the two essentials in his work. 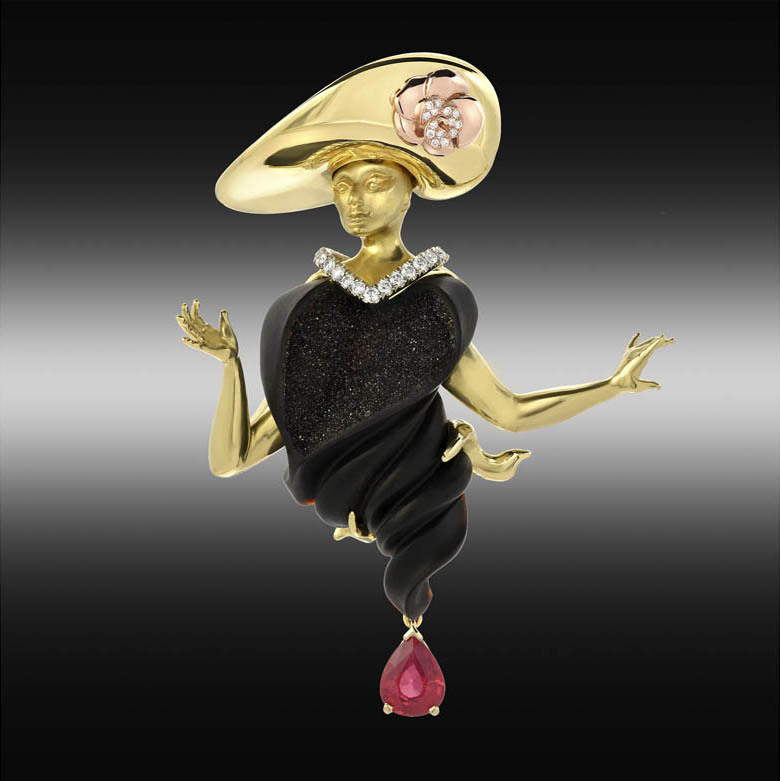 18K yellow gold, diamonds, red spinel, druzy onyx and 18K rose gold. 18K white gold was used to set the diamonds. I hand carved the piece and then had it cast. I bought the stone and immediately visualized it as a woman. At the same time, I had watched a special on Mata Hari and felt the piece should be dedicated to her since she was such a dramatic individual, so I named it after her. A few years ago I purchased the stone and had started the piece then. I set it aside and only finished it recently. You can make beautiful pieces of art jewelry by combining carved gemstones and precious metals. Eventually … probably … yes. Does it reflect your current look/designs? Not too much. I create mostly traditional jewelry. I also do custom work for jewelry stores and other people in the jewelry industry. This is my own personal creation. Glendale, California and my office is in downtown Los Angeles, in the Jewelry District. A little bit, but I am mostly self-taught. Not really. People would show me things when I needed to take the next step. From my teenage years. Jewelry is an art, and I love art. I started making pieces when I was around 25 years old. Before then, I was a plastic surgeon, working mostly with face recovery in Armenia. When I came to the United States, I was working on getting my green card. At the same time, a friend was working in a jewelry store in Michigan. My friend was moving to California, so I took his place doing repairs and setting stones. I graduated from art school in Armenia. My regular work is to do custom orders for jewelry stores. I hate to work on the same ring twice; it has to be something new every time, so this is perfect for me. I enjoy what I do, so it is more like a hobby than a job. My jewelry needs to be impeccable and beautiful both inside and outside. Word of mouth. I have a lot of clients now, and I am not trying to grow by having a larger quantity of clients but by focusing more on quality. I also get a lot of referrals. I use people as subcontractors. Casting I don’t do in-house. I outsource that type of work. Platinum, gold and a little bit of silver. That I can leave something beautiful for future generations. Describe the first piece of jewelry you made. It was a cross I made for my mother. I am in the James Oviatt Building in LA. The coziness and the location are my favorite things about my studio. When I open up my window, I can see a square in downtown, and when I walk out, there are a lot of restaurants. My building was built in 1920, and everything in it iseverything it is custom made; it is a piece of art itself. I love being in this building. All of the building materials and accessories were shipped from France. People are always shooting movies in the lobby. It is very interesting. The restaurant scene in Pretty Woman was filmed in the restaurant downstairs. There is a lot of art on the walls of my office with no empty spaces. My hands. Without your hands, no tool is any good. I would give the same advice both in jewelry and in life. It is very important to never give up. Gaudi because of his architecture. DaVinci is the maestro for me. Faberge as a jeweler. Henry Dunay. I love his work. It was totally unexpected! It was great! I felt that this time my entry was more of an art piece, and I wasn’t sure if that would be a plus. I like how the competition is organized and the fairness of the judging. I want to support the organizers and be a part of it. And I tell everyone who is capable of making good work about it and encourage them to enter. I have won the Accommodation Award in the International Pearl Competition.